'THE POWER TO WRITE': Marie Colvin, a war correspondent killed in Syria in 2012 began her journalism career Teamsters Local 237. Last week, Colvin’s sister, Cathleen, was presented with an award named in her honor. Pictured are Katrina Heron, Marie Colvin’s best friend; Cathleen Colvin; and Greg Floyd, the president of Local 237. 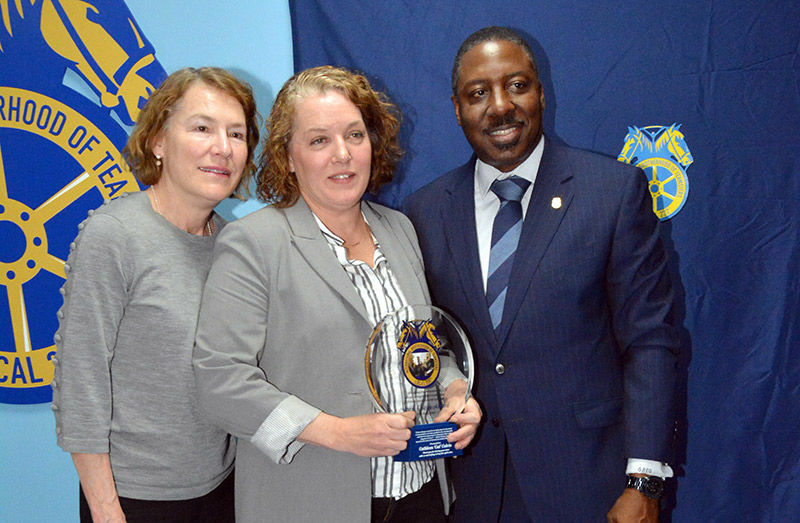 Assassinated war correspondent Marie Colvin, who began her career as a writer for the Teamsters Local 237 newsletter, was honored at the union’s headquarters March 21. 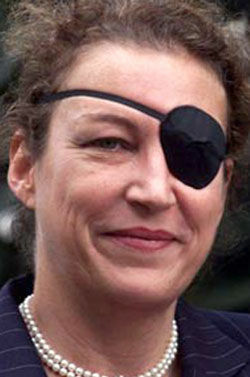 Ms. Colvin, who was blinded in one eye in Sri Lanka in 2001, reported on civilian deaths in Syria and was killed in a rocket attack in 2012 at the age of 56. “She saw the dedication we had to our members,” he said. He told stories of how Ms. Colvin connected with the members, who often turned to her about their difficulties on the job. Mr. McDermott said she’d rant and rave about unfair conditions for members she heard about, including one case where the city was moving to lay off 19 seamstresses at the Health and Hospitals Corporation. “She turned the News and Views into the members’ mirror,” he said. Manhattan Borough President Gale Brewer, City Comptroller Scott Stringer and Lieutenant Gov. Kathy Hochul also celebrated the journalist’s life and legacy. Ms. Colvin’s sister, Cathleen, said that her view of the world started with the union. Journalist Katrina Heron, whom Ms. Colvin met in college and became best friends with her, said that she had immense pride when she received a badge from Teamsters. “She said ‘I’ve got to get this badge sewn onto my bomber jacket now.’ That badge meant everything to her,” Ms. Heron said. Local 237 President Gregory Floyd presented Cathleen with the “Marie Colvin Award,” dedicated to those who fought for others. “Though none of us could walk in her shoes, at least for a while, she walked among us,” he said. Ms. Colvin stayed at the union for just two years, eventually moving on to work at United Press International in Trenton, New Jersey. “But maybe it’s like some people say: ‘You are the sum of your short stays,’” Mr. McDermott said. The union also honored three women who served as plaintiffs for Local 237’s 2010 pay equity lawsuit: Bernice Christopher, Patricia Williams and the late Corinthians Andrews. Mr. Floyd filed the suit to address a $7,000 wage gap that School Safety Agents faced in comparison to other titles performing similar duties in other city agencies. About 70 percent of the city’s 5,000 School Safety Agents were women, and predominantly black and Latina. He said that the union asked 25 women to join the lawsuit, but Ms. Andrews, Ms. Christopher and Ms. Williams were the only ones who signed on. The union won the lawsuit in 2014, but it didn’t have much support, Mr. Floyd admitted. That’s why it also honored two women who helped the fight: Hazel Dukes, president of the state’s NAACP chapter, and Sonia Ossorio, president of the National Organization for Women’s New York City chapter.